In the wake of years of countless exhibits exploring globalization, and how we are all connected in some way, shape or form the Elevation 1049: Between Heaven and Hell is rather refreshing. The concept of the exhibit is to celebrate the specificity of place, not the global, and explore Gstaad, Switzerland by Swiss artists only. Basically it’s public art above and around this snowy town. Most of us will not be able to attend, so they’ve made a highly informative and well documented web site where you can see the artists’ work in situ via web (helpful). My favorite is Pipilotti Rist’s adorable, and slightly naughty, installation at the Hotel Olden. 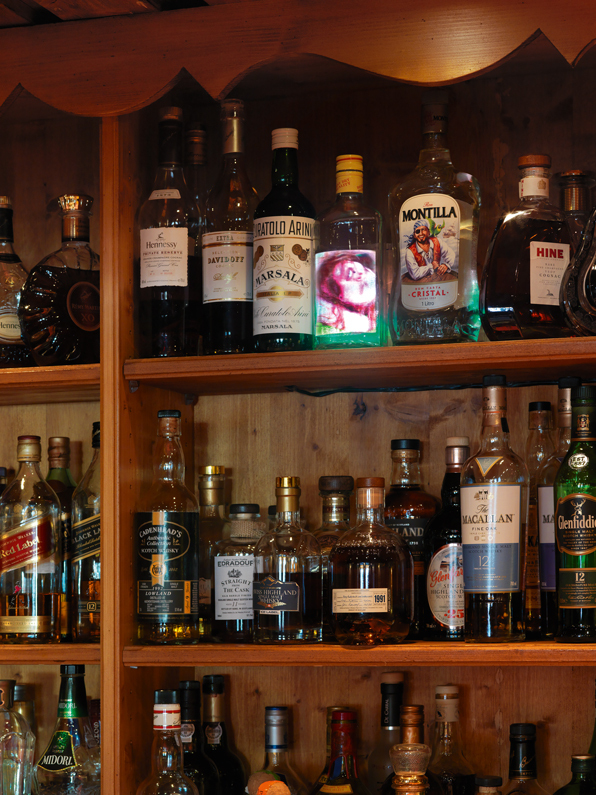 A video of hers is projected on a bottle at the bar – a perfect treat for unsuspecting, wandering eyes at the bar. The exhibit was curated by Olympia Scarry and Neville Wakefield, and made possible by the LUMA Foundation and generous advertising dollars of Dior and BMW. While I don’t agree with the subtitle – most of the work does not remind me of hell (except for maybe Rist’s piece). Gstaad is an idyllic ski town known as a popular location for Bollywood films, and a discreet escape for the rich and famous. 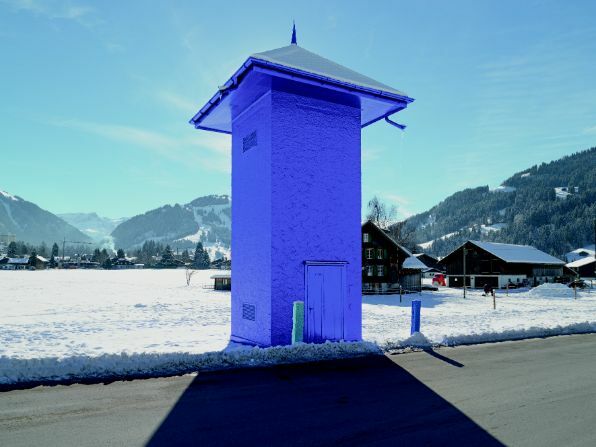 Scarry has been quoted in this month’s Surface Magazine as saying the exhibit is a way to have a dialog between the artists and the collectors, versus simply the collectors spending time in Gstaad. They are hoping the exhibit morphs into a nomadic piece that will travel to various locations. Next stop they envision is Mexico, where they are calling it the “Zone of Silence”. 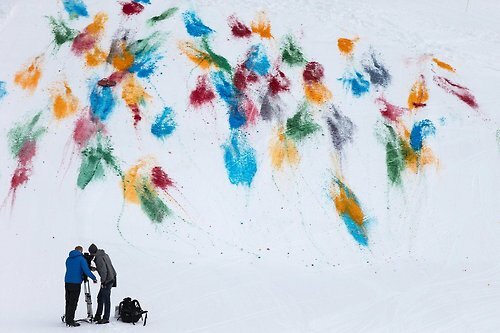 Olaf Breuning, public action painting on snow in Gstaad for Elevation 1049. Breuning had the public dump toboggans full of paint on the snow. Fun.